By my prescience I find my zenith doth depend upon a most auspicious star, whose influence if now I court not, but omit, my fortunes will ever after droop. 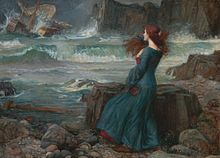 The Tempest is a play, often described as a comedy or romance, by William Shakespeare. It is believed to have been written ca. 1610 - 1612. Tempest (1982); a very loose adaptation of the story. With those that I saw suffer! Boatswain: Do you not hear him? You mar our labour: keep your cabins; you do assist the storm. Boatswain: When the sea is. Hence! What cares these roarers for the name of king? To cabin! silence! Trouble us not. Boatswain: None that I more love than myself. You are counsellor; — if you can command these elements to silence, and work the peace of the present, we will not hand a rope more. Use your authority; if you cannot, give thanks you have liv'd so long, and make yourself ready in your cabin for the mischance of the hour, if it so hap. Now would I give a thousand furlongs of sea for an acre of barren ground — long heath, brown furze, anything. The wills above be done, but I would fain die a dry death. Of thee, my dear one! thee, my daughter. To credit his own lie. Ariel, and all his quality. And do my spriting gently. Than bees that made 'em. That e'er I sigh'd for. Good things will strive to dwell with ’t. Sebastian: Well, I am standing water. Antonio: I'll teach you how to flow. Would cry to a sailor Go hang! Trinculo: Swam ashore man, like a duck; I can swim like a duck, I'll be sworn. Stephano: Here, kiss the book. Though thou canst swim like a duck, thou art made like a goose. Caliban: Hast thou not dropp'd from heaven? Stephano: Out o' th' moon, I do assure thee; I was the Man i' th' Moon, when time was. 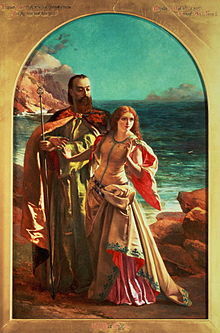 Caliban: I have seen thee in her, and I do adore thee. 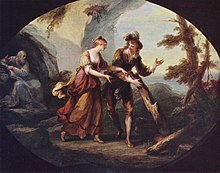 My mistress show'd me thee, and thy dog and thy bush. I prithee, be my god. Ferdinand: Here ’s my hand. Miranda: And mine, with my heart in ’t. Servant-monster! the folly of this island! They say there's but five upon this isle: we are three of them; if th' other two be brain'd like us, the state totters. I'll not serve him, he is not valiant. valiant monster would destroy thee: I do not lie. Stephano: Trinculo, if you trouble him any more in's tale, by this hand, I will supplant some of your teeth. As rootedly as I — burn but his books. Alonso: Give us kind keepers, heavens! What were these? 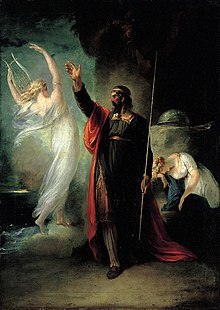 The name of Prospero; it did bass my trespass. Summon'd me hither to this short-grass'd green? Hear a foot fall; we now are near his cell. Stephano: There is not only disgrace and dishonor in that, monster, but an infinite loss. It is this statement by Miranda which provided Aldous Huxley the title of his dystopian novel, Brave New World, in which "The Savage" quotes this passage.